yes, that jewelry is beautiful. I have many of my mothers bursztyn pieces and love to wear them from time to time, but agree that the string they sit on does perish eventually. In Krakow, my dh bought me a champagne bursztyn as amber can come in different shades of yellow and orange. They are a very comforting stone, probably not very expensive if ti comes to being precious, but loved nonetheless! The colours are beautiful, aren't they? I have a pair of earrings of my mum's and the stones are a creamy shade. I must get the necklace repaired - it was something she kept meaning to do. Such beautiful stones, they glow with warmth. 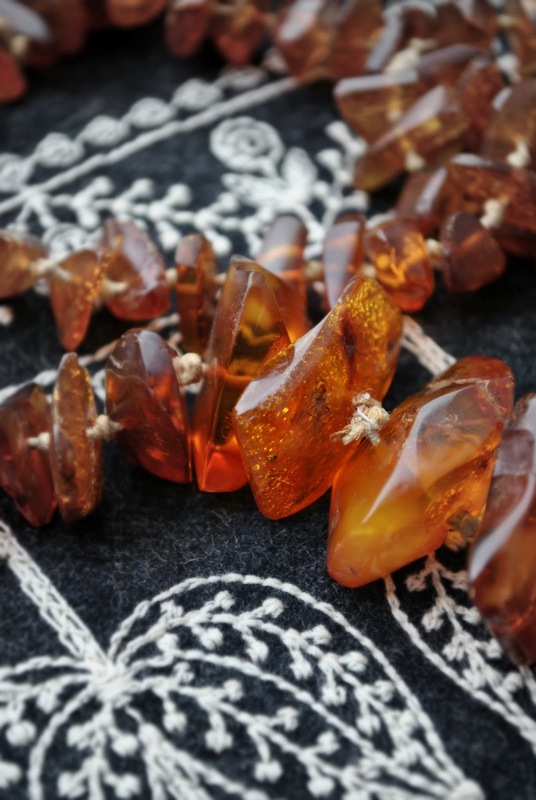 I don't wear orangey tones usually but I'm happy to wear amber jewellery. Apparently amber's quite therapeutic so who knows, maybe it'll have some kind of calming effect! I have always loved amber, and I love how you describe how it looks and feels. How wonderful to have a family piece like this, with such strong connections to your Polish heritage. I seem to be going a bit Poland mad at the moment and I suspect it's because I now recognise the importance of keeping that side of our family story going... but it's an interesting and colourful (literally) part of our lives. I'm happy to keep indulging myself! Thanks Jane. I don't think amber's particularly valuable but yes, it certainly is when you look at it in terms of memories and meaning. I'd heard about the teething thing a while ago - you just reminded me! On the theme of amber, I'm fancying reading 'The Hare with Amber Eyes' as I've heard it's a good book. Your necklace is beautiful. I've always liked amber too. I love the naturalness of it, every piece is a little different. Sarah..is that the komnata bursztynowa that youre talking about here? I have heard something about that but vaguely. I was disappointed with "The Hare With The Amber Eyes"; it was a reading group book many moons ago and I seem to recall I wasn't the only one. That said my reading tastes have changed since then so don't take my word for it! I have to say, I'm really getting a lot of use from the local library. I order books for collection and if they're not great I just give up and move onto the next! I'll order it and give it a go and let you know! 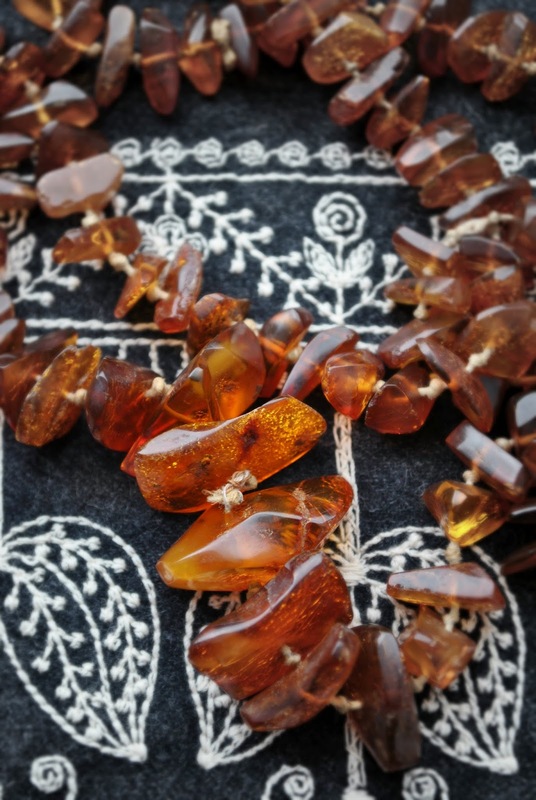 I have a few items of amber jewellery - most of it not worth a lot in money terms but precious because of the memories. 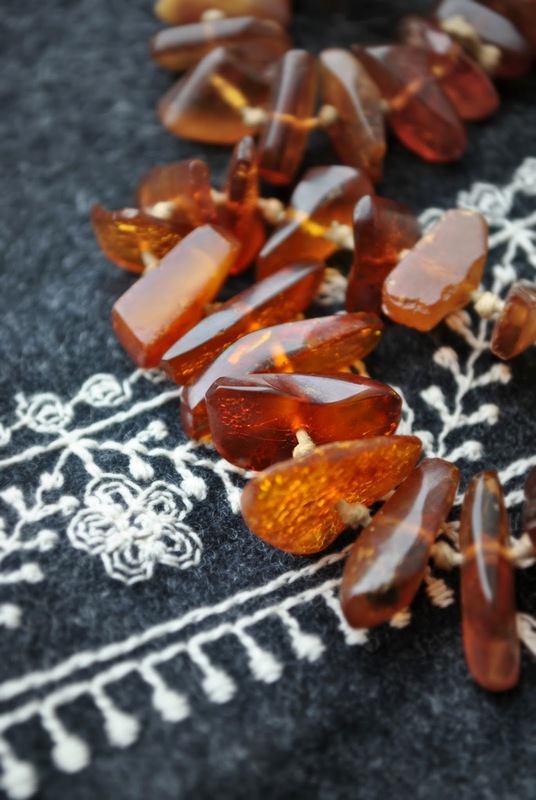 I have a necklace and earrings that are a very pale amber that were quite expensive - my husband bought them when we cruised earlier this year to St. Petersburg. Seems it's quite popular! I do love mine and now wear my green amber ring every day. My mum bought it for me and it reminds me of her. That's interesting... I'll have to look up which colours are the most covetable. I'm like you, it doesn't have to be anything extraordinary or expensive to be worn as one of my favorites. I like the way you compare amber to Bohemian. I can see it in my mind's eye, it is such a carefree stone. I have some favorites from my family that I will get out and wear on occasion too.